After our round up of three Hangman games found Mobilityware’s Hangman 1.7 to be the cream of that small crop, a number of readers suggested follow-up reviews of their favorite hangman apps. Among the most common suggestions was that we take a look at iHangman 1.4 from Xtremize Software, and so we did—it turned out to be a very good suggestion. Hang In There: The primary iHangman screen includes your game score (upper left), your running score (upper right), and a timer (bottom middle)—all welcome additions to the hangman game category. iHangman is a true heavyweight of iPhone and iPod touch hangman games: it boasts 15 word categories and more than 39,000 words, not to mention a dictionary with far more depth than the games reviewed back in December. In addition, iHangman includes an optional timer that’s part of a scoring system that awards players points based on the difficulty of the selected word category and whether the game is being played under a time limit. This scoring system adds a competitive component to the proceedings and, at the same time, makes each individual game part of a larger quest. When you win a game you get between 1 and 8 points, and the points keep adding up until you lose. So the goal is to win consecutive games at as difficult a level as possible. These options enable you to play a casual game—or a very challenging (and frustrating) one. In other words, iHangman can be addictive. In iHangman’s straightforward settings screen, you can choose either to bypass a time limit option, or select a time limit of 30 seconds, 1 minute, or 2 minutes. (You score one extra point for winning within a 2-minute limit, two points for winning within 1 minute, and three points for winning within 30 seconds). You can select to play in single- or two-player mode. You can turn sounds on and off. You can also choose one of the 15 word categories, ranging from “Easy” (one point) to “Standard” (three points) to “Reverse” (the words are spelled backward, and solving the puzzle counts for five points). Among the other categories are SAT words, GRE words, Sports, and Celebrities. Increase Your Word Power: iHangman is nearly perfect, but suffers from one flaw: extraordinarily obscure words, such as “deliquesce,” are included among the group of Standard terms. I found the Hard word category to be as hard as expected and the Standard category to be a bit confounding at times. Some words presented in the Standard category aren’t words that are used in the average adult’s standard vocabulary; they’re obscure to the extreme that I had never even heard of some of the words. This poses a unique—and unwelcome—difficulty, as the fun of the game is in plumbing the depths of your own vocabulary, not in being stumped by an obscurity. I argue this because in iHangman—especially in the catch-all Standard mode—the words are presented without context, which means that there’s a limit to the educated guesswork you can do. Otherwise, iHangman is a creative and well-executed offering that now tops Hangman 1.7 in my estimation. It has a clean, intuitive, interface that’s easy on the eyes. There are plenty of options. 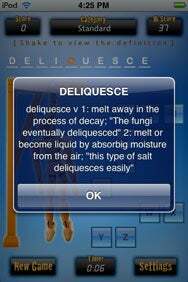 It even uses the accelerometer in a nifty fashion; when you’re stumped by a word (and you will be), a shake of the iPod results in a pop-up dictionary definition. 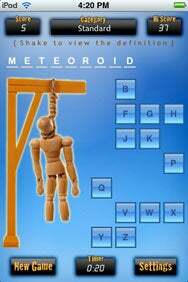 iHangman is compatible with any iPhone or iPod touch running the iPhone 2.x software update.